Two boxers size each other up while listening to the referee’s instructions. WESTFIELD – The College Men’s Club of Westfield hosted their 15th annual “Night at the Fights” on Friday, Feb. 3 at the Kenilworth VFW and set a record of $24,000 raised for financial aid for college-bound high school boys in Westfield. 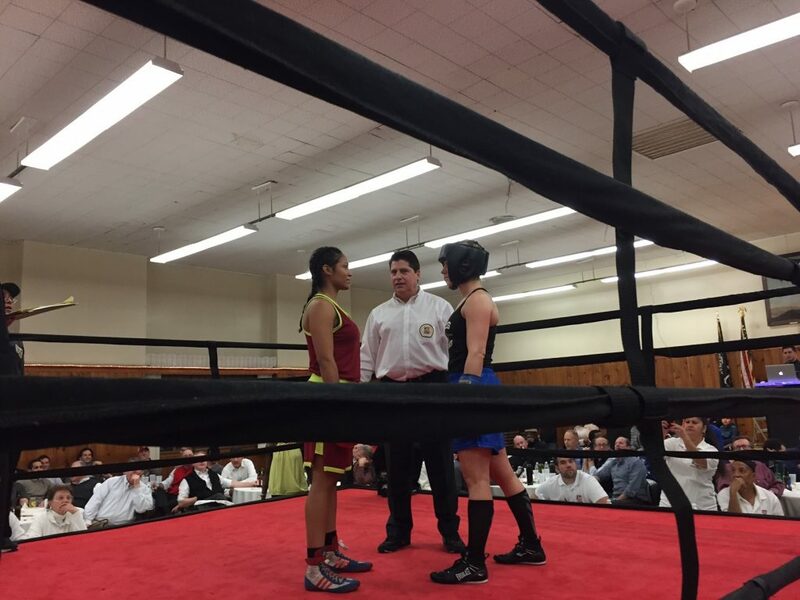 The event was a sell-out with over 250 guests attending for dinner and 10 terrific amateur bouts, highlighted by the main event between two talented up-and-coming female fighters who went toe to toe for three tough rounds. High school senior boys should visit the Club’s website at https://www.cmcwestfield.org/apply for information on applying for college scholarships. The deadline for submitting scholarship applications is Friday, April 21. High school junior boys can apply on the Club’s website for financial assistance with ACT test prep courses. The deadline for these applications is Monday, March 27. The College Men’s Club is an all-volunteer organization that was founded in 1922 by a group of college graduates who wanted to provide money for higher educational opportunities to deserving young men in the community. Last year, it awarded over $60,000 in scholarships and it has raised over $1 million in scholarship money in its history. The Club has helped many students with financial need, particularly those who might not otherwise be considered for assistance. Students who are struggling with life issues, or need to work after school to help support their families, gain special consideration. The Club looks closely at those who need the extra help, yet have a strong desire to attend college and succeed in life. Please visit www.cmcwestfield.org where you can learn more about the College Men’s Club and make a donation to help the young men of Westfield realize their dreams.